IF you are new to Kuala Lumpur, chances are you probably don’t know that there is a hot springs spot in the city. As a matter of fact, I have known of a few friends who had been in the city for years but were surprised when I told them that there was one. Many have heard of Air Panas, off Jalan Genting Kelang, in Setapak, just 4km north of the city centre but few, except locals, know that there is actually an “air panas” or hot springs in Setapak. As a matter of fact, this suburb that was also referred to as Hot Springs probably received the name from the thermal pool. 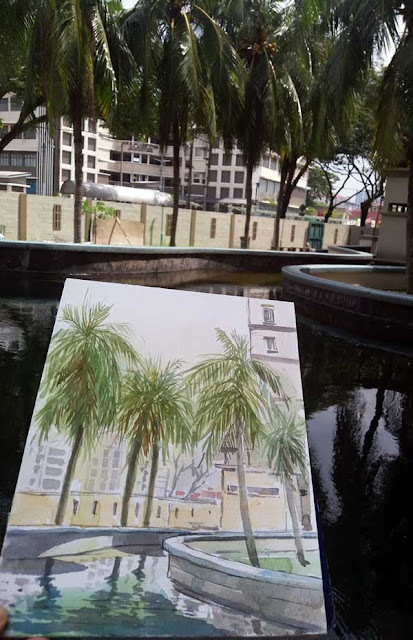 This watercolour sketch depicts what’s left of the thermal pool that was once the size of two badminton courts. In the 1970s when I was studying at Setapak High Secondary School, my friends and I used to stop by here on our way home in the evenings for a hot bath. At the time, the hot springs was merely a large hot steaming pool. There was a dilapidated hut at one corner and several run-down zinc-roofed baths at the other end. It was adjacent to a lalang grown field that was used by an Indian dhoby operator. A caretaker at the pool charged 10 sen for the rental of a roped bucket used to draw water from the pool. If you brought your own pail or bucket, you could bathe for free. The bottom of the pool was filled with a velvety bluish-green carpet of algae. Bubbles could be seen rising from the depths. When the algae died and floated to the surface, there was a stench similar to that of rotten egg. On rainy days, the water was especially hot and wisps of steam could be seen gliding across the surface like ghostly apparitions. Some people would lower eggs into the pool and boil them in a jiffy. Those days, the pool had its share of regulars who swore that the mineral-rich waters could rid them of skin ailments. Womenfolk living in the area too preferred to wash their clothes by the pool as they swore the waters made their clothes whiter than white. It was not known when the pool was discovered or who found it. It could probably be as long as the suburb itself. I found an old press cutting of the Straits Times dated May 20, 1891, which stated that two hot spring pools had been identified in Selangor as “having therapeutic values”. According to the article, one was located in Hulu Kelang and the other in Setapak. The British government at the time had been urged to properly set up both sites so that their spring water could be used, separately, for bathing and drinking. It was a tourist attraction of sorts at the time, drawing people to have picnics around the pool or bathed there. In a Dec 17, 1950 Straits Times article, however, the hot springs pool was said to have lost its appeal because of rumours that a ghost was spotted in the area. Partly abandoned, the thermal pool was used by a dhoby. I am not sure if the same dhoby operated right up to the 1970s. I recall seeing white bedsheets being hung out to dry on the long clotheslines at an adjacent field. Today, what remains of the pool that gave Hot Springs its name is swallowed up by development in the area. The pool lies in the compound of the Resource Springs apartment but it is still open to public, daily from 7am to 8pm. For a small fee of RM2 you can have a hot bath here. There is a bathroom with cubicles for men and women. The management has also provided a number of foot-baths around the pool and there is even a small kiddy pool fed by hot water from the main pool. Regulars still swear by the efficacy of the waters and according to the security personnel at the gates, some people would come to collect the water for bathing back home. Some even used the water for drinking, the watchman told me. The pool is quite clean and the water is still crystal-clear. People still throw coins into the pool probably in hopes of a wish fulfilled. From the city centre, drive north towards the Tun Razak roundabout and take the Jalan Pahang turn. Drive until you pass Setapak Town and when you come to a fork in the road, where the Setapak Police Station is, take the road on the right. You should see Courts Mammoth after passing the police station. Keep right till you arrive at the traffic lights junction that turns right. Immediately past the traffic lights is Jalan Air Panas. The Resource Springs apartment is 1.2km from here.